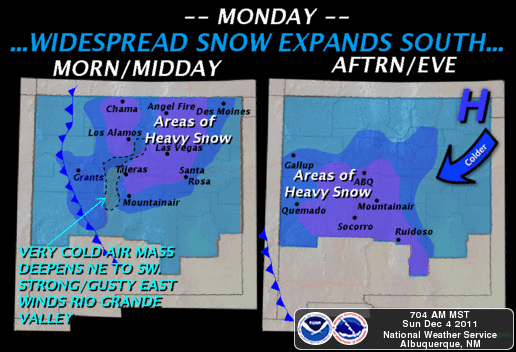 Accumulating Snows In SE NM...Major Winter Storm For NM! 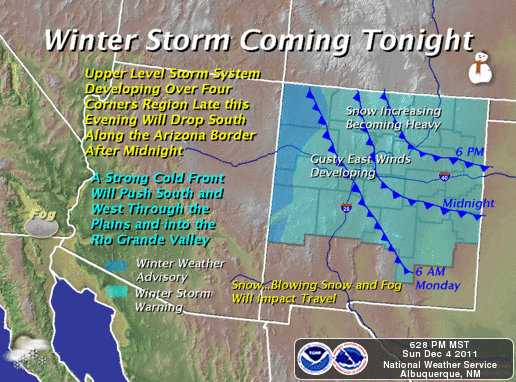 Map Are Courtesy Of The Albuquerque NWS Office. 3-Day Liquid Precipitation Total Forecast Map. 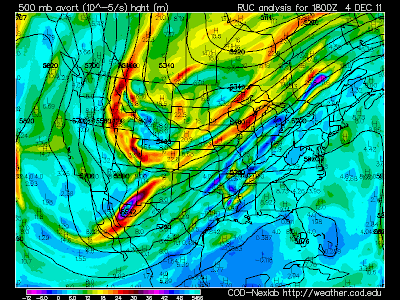 Valid 5 PM MST Sunday - 5 PM MST Wed.
RUC 500 MB Analysis At 18Z/11 AM MST Today. Blog updated at 10:50 PM MST. As our second winter storm approaches tonight (as depicted by the short wave located across southwestern New Mexico at 11 AM MST, on the Rapid Update Cycle 500 millibar map above) rain and snow showers will increase across southeastern New Mexico. 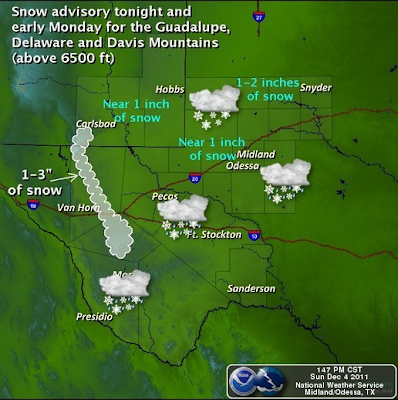 A Winter Weather Advisory has been issued for the Guadalupe Mountains where 1" - 3" of snow is forecast to fall. Snow should start falling by early this evening. Around noontime today a pocket of light rain showers and light sleet moved across parts of southeastern New Mexico. I picked up .01" of rainfall out of this precipitation burst here in Carlsbad. A rain/snow mix is still forecast for the lower elevations of the local area tonight up until about midnight, when the rain should have turned over to all snow. This could happen before then since it was not quite as warm as was forecast for today. A few thunderstorms are also forecast to dot the area tonight as well. Anyone lucky enough to get thunder tonight, will see a little heavier burst of snow, and perhaps some sleet that those of us who don't. Current forecasts indicate that we should see only light accumulations of snow here in Eddy and Lea Counties tonight. Heavier snowfall totals are anticipated tomorrow into Tuesday for SE NM with at least a couple of inches possible...maybe, just maybe more. Our low temperatures are forecast to drop below freezing here in SE NM tonight, so some of our roads could be slick in the morning. This will be especially true in those areas that manage to get heavier snowfall totals than is currently forecast. US 62/180 from Carlsbad to Guadalupe Pass could become very icy and slick tonight into tomorrow morning, especially at the higher elevations near Guadalupe Pass. Our roads westbound (US Hwy's 70 & 82) and northbound (US Hwy's 70 and 285) out of the Pecos Valley, will become increasingly problematic tomorrow with time, as heavy snow falls across the Sacramento Mountains, and northward across the eastern plains into the Vaughn, Santa Rosa, and Clines Corners areas. Sections of I-40 and I-25 across the state will likely be shut down once again. A re-enforcing surge of bitterly cold air will arrive tonight. We will struggle to get above freezing from late tonight into Wednesday. Tuesday night into Wednesday morning is going to be very cold. Our lows are forecast to drop down into the teens, with a few single digit temps possible across the lower elevations. If we get a decent snow cover on the ground, then look out...the bottom may fall out of the thermometer, and I think some of us could see subzero temperatures by Wednesday morning. 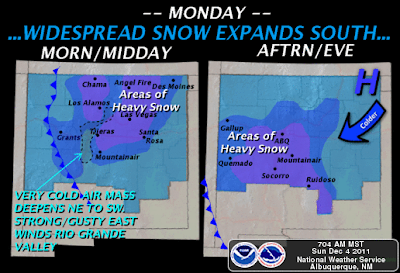 Monday - Wednesday Across New Mexico. 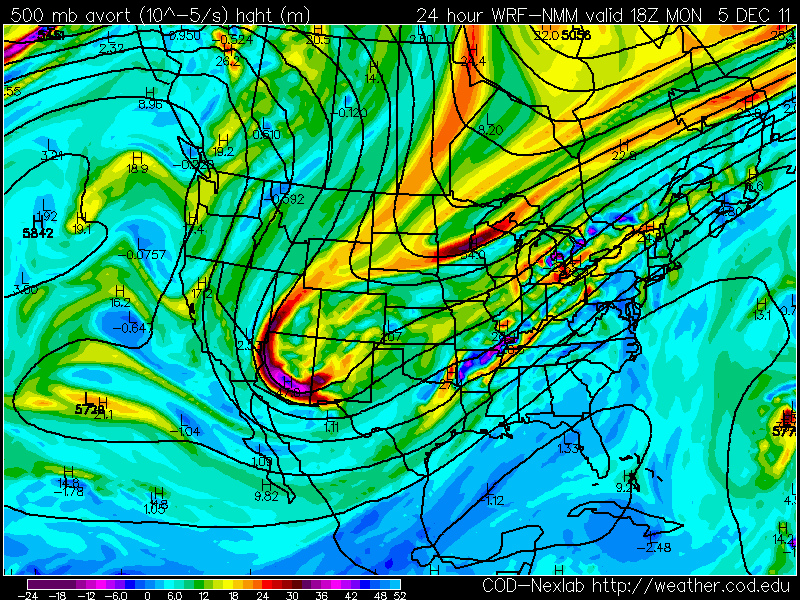 WRF-NMM 500 MB Heights/Vorticity Forecast. Valid At 18Z/11 AM MST Monday. Round three with mother nature and her winter antics arrives Monday into Tuesday night. The third, and final short wave is forecast to dig southeastward into the Four Corners Area tomorrow. 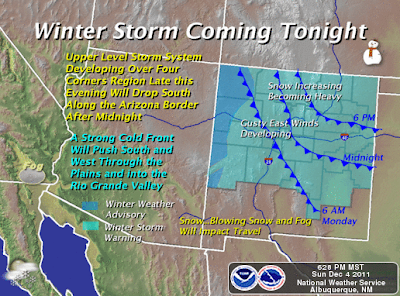 By about 5 PM tomorrow afternoon, the upper-level low is forecast to be located near Gallup. It is then forecast to crawl slowly eastward along the I-40 corridor, and finally enter the Texas Panhandle Tuesday afternoon or evening. 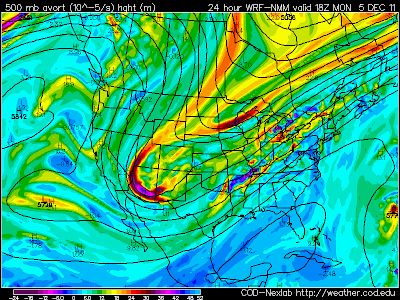 This is of course if the closed upper-level low behaves as the models are forecasting. They are tricky and don't always follow the rules. A Winter Storm Warning is now in effect for the southern Sacramento Mountains from 8 AM MST Monday through 11 PM MST Tuesday. National Weather Service Forecasters in the El Paso Office, are now expecting 12" - 15" of new snowfall Monday into Tuesday at elevations above 7,500'. 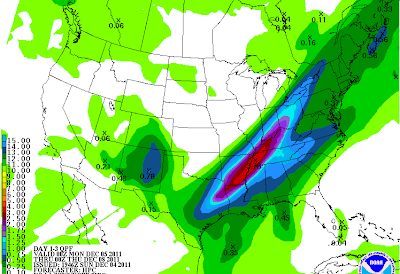 Isolated higher totals than this may occur. 7" -12" totals are forecast below 7,500'. This warning includes Cloudcroft, High Rolls/Mountain Park, Wimsatt, Mayhill, Weed/Sacramento, Timberon, Sunspot, and Pinon. A Winter Weather Advisory is now in effect for the Alamogordo, and Tularosa areas from 8 AM MST Monday through 11 PM MST Tuesday. 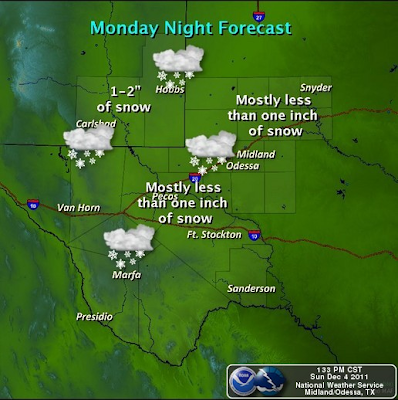 National Weather Service Forecasters in the El Paso Office, are now expecting 3" -6" of snowfall Monday into Tuesday. A Winter Storm Warning is now in effect for Lincoln County, Chaves County, and Roosevelt, Curry, and De Baca Counties through 11 AM MST Tuesday morning. 6" -12" of new snowfall is forecast to fall, with higher totals across the higher peaks and ridges. Much of the eastern plains of the state could see 6" -12" of new snowfall, except near the NM/TX state line where 2" - 6" is forecast. Northeast to east winds at 15-25 mph will be common across all of these areas. This will create areas of blowing and drifting snow which will reduce the visibility down to less than 1/2 of a mile at times. Widespread travel problems are a real possibility for many areas of the state tomorrow into Tuesday evening, as mother unleashes her winter fury on the state. Road closures are going to be likely due to snow, heavy at times in some areas. Blowing and drifting snow, along with icy conditions will only add to the travel headaches across the state. 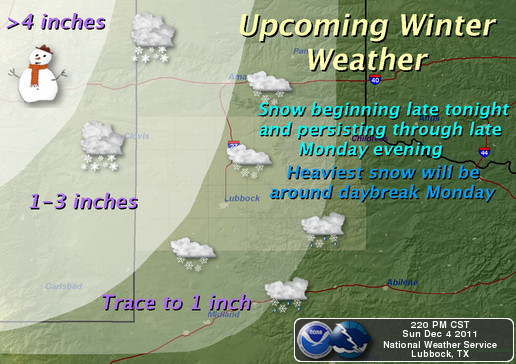 For the latest road conditions across New Mexico please visit this link.